Readers and a New Venue Announced! 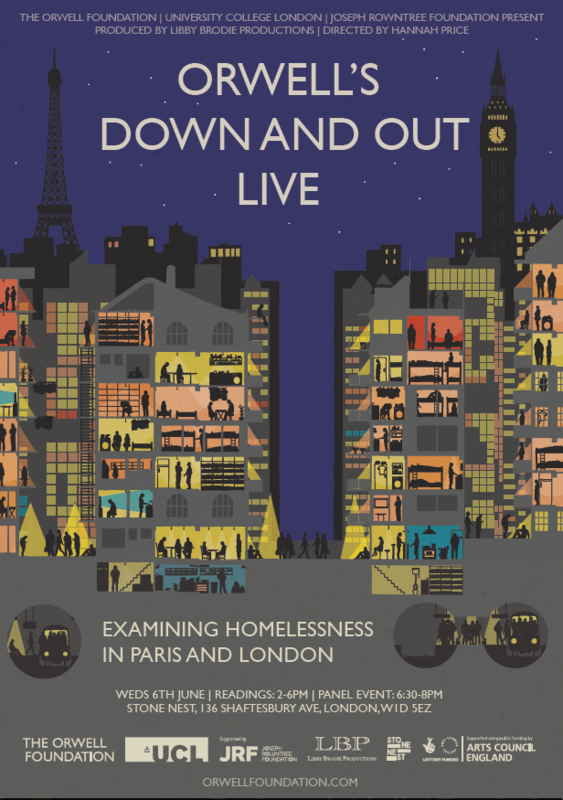 George Orwell’s Down and Out in Paris and London is being read and staged in an immersive, live theatrical event combining performance, music, film, poetry and story-telling for the first time at Stone Nest in the heart of London’s West End. Orwell’s ground-breaking exploration of poverty and homelessness in published in 1933 has a searing relevance to the issues of today. The Orwell Foundation, Libby Brodie Productions, UCL and the Joseph Rowntree Foundation have worked in collaboration with The Connection, YMCA, Centrepoint, Crisis and Streetwise Opera. inform and shape feelings about such issues will be followed by an expert panel discussing the policy and political solutions that are needed to help solve the problems. The ideas, the words, the immersive dramatization, the sets and sounds – have been shaped by collaboration with people with experience of the variety of modern homelessness and poverty. The project has worked closely with service users from The Connection at St Martins in the Field and young people from the YMCA in Stoke (where the Orwell Youth Prize has run writing workshops) to collect individual stories of the journey to rough-sleeping and homelessness. Some who have bravely shared their stories will be readers on the day. From the start we have wanted to use the authority and integrity of Orwell’s work to give a platform for people who have experienced homelessness to speak out and, for the first time, share their stories with the public. Among other distinguished readers are Jon Snow, Bonnie Greer, Peter Hitchens, Simon Callow, Jack Monroe, Sali Hughes, David Schneider and Ben Aldridge. Four artists have been commissioned to create responses to contemporary homelessness and want. Poets Adam Kammerling, Sabrina Mahfouz and Joelle Taylor’s work will be part of the event. Edwin Mingard will make a film in reaction to the programme and the later event in Paris which will be launched later in the year. Hannah Price has worked to bring these various pieces and fuses them with some newly created scores from the contributing actors and musicians to create an original, evocative and ground-breaking new piece of theatre. The event is supported by funding from Arts Council England, UCL, Orwell’s son Richard Blair and The Joseph Rowntree Foundation.